I. "What is the sound of one transistor clapping?" 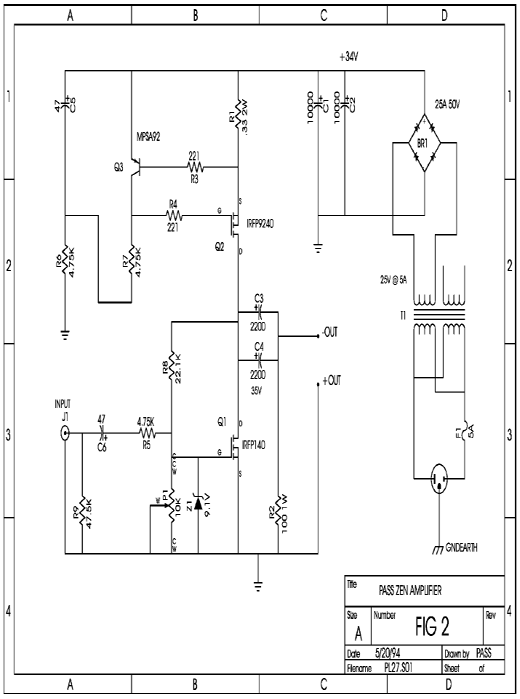 There are two most essential principles to audio amplifier design. The first is simplicity. The second is linearity. Einstein said, "Everything should be made as simple as possible, but no simpler." Simplicity is a common element of the best and most subtle designs. It is preferred for purely aesthetic reasons, but also because fewer elements color the sound less, and lose less information. Many audiophiles, including myself, are willing to sacrifice other areas of performance to achieve the intimacy with the sound available through a simple circuit. 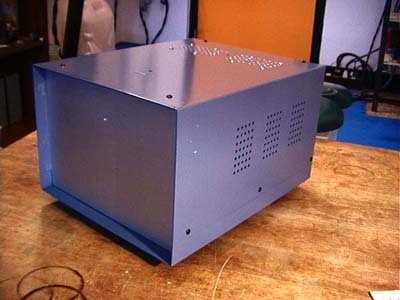 An amplifier should be simple, but it also must be linear. 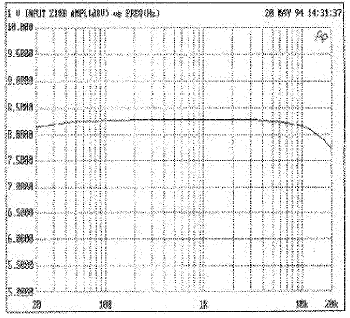 Some measure of distortion in an amplifier is unavoidable and forgivable if it is of a less offensive type, but still it is important that the measured distortion performance be reasonably low. The advantage of a simple circuit is lost if the sound is overlaid with an excess of false coloration. Many complex topologies have been justified by high quality of measured performance. By objective criteria, this is a perfectly valid approach. There are many applications where the need for measured precision is important and subjective performance is unimportant. Any application where the performance is crucial to obtaining accurate numbers, such as in an MRI field amplifier, should be judged by objective means. But this is not rocket science; our objective is to make listeners enjoy sound. If we justify this approach by calling it art instead of science, that is perfectly fine, even preferable. Resolving the apparent conflict between simplicity and objective performance is our goal. 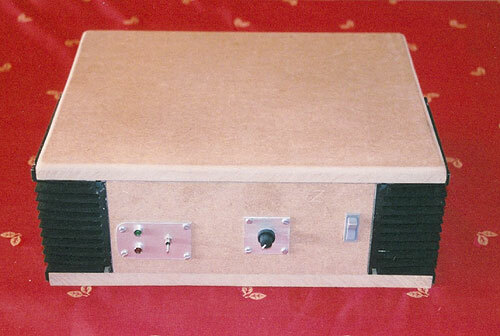 Commercially available power amplifiers have as many of 7 gain stages in series. The simplest I know of still has 3 stages. This succession of gain stages is essential to build up excess gain that can be used for negative feedback. The feedback is used to correct the performance of the gain stages. Paradoxically, the extra gain is used to correct the extra distortion of the additional gain stages. How simple can we make a circuit and still have it perform well? Obviously an amplifier with a single gain stage will be about as simple as we can topologically create, and we ask the question, "How much performance can we get out of a single gain device?" times their rated output. Typical efficiency is about 20% maximum. This tremendous inefficiency alone explains why Single-Ended Class A has received limited attention, although careful consideration of possible circuits reveals that efficiencies approaching 50% are possible. In addition, there are ways in which a Single-Ended Class A amplifier can be operated as a push-pull device beyond its bias point, the assumption being that push-pull performance is preferable to clipping. Pass Labs has received one patent and has an application for another reflecting new developments in this area. Figure 1 shows a simple example of a Single-Ended Class A circuit. In this case the gain device is a FET, although the concept applies equally well for a tube for bipolar transistor. The input signal is applied at the gate, and the transistor provides current and voltage gain which appears at the drain. The gain stage is biased by some form of impedance which sources the bias current to the transistor. This impedance might be a resistor, or it might be a constant current source, or it might be some other load, such as a loudspeaker. Because this element carries the DC bias current, it is unlikely that we would want to use a loudspeaker for this, and typically we would want to attach the loudspeaker in parallel with the bias element, in series with a blocking capacitor. energy inefficiency. 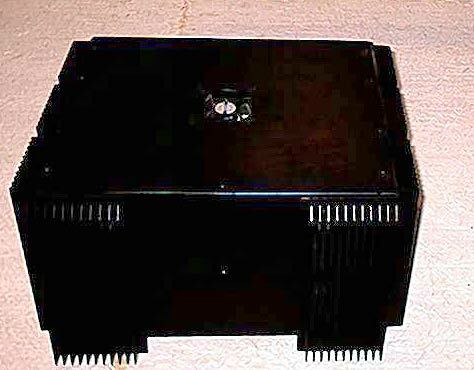 Single-Ended Class A operation has received increased attention lately, primarily from tube enthusiasts, and recently a number of companies have introduced tube SingleEnded Class A amplifiers. They are characterized by limited power, high cost, and multiple gain stages. 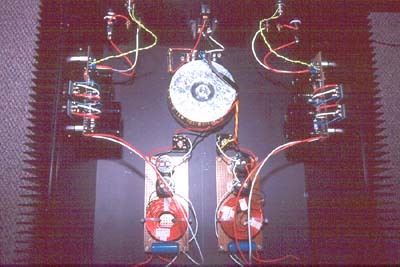 I published a 20 watt bipolar Single-Ended Class A design in 1977 in Audio Magazine, and it had four gain stages. 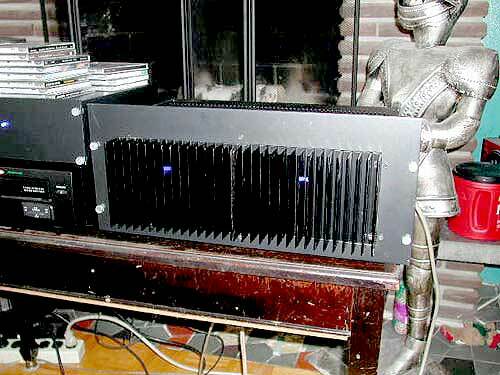 Pass Labs has been manufacturing the Aleph series of Single-Ended Class A amplifiers since 1992, and they have three gain stages. I am unaware of other solid state offerings in the US, although I expect that my hegemony will be shortlived, with the imminent appearance other single-ended transistor amplifiers. Simplicity is not the only reason for the use of the single-ended topology. The characteristic of a single-ended gain stage is the most musically natural. Its asymmetry is similar to the compression / rarefaction characteristic of air, where for a given displacement slightly higher pressure is observed on a positive (compression) than on a negative (rarefaction). Air itself is observed to be a single-ended medium, where the pressure can become very high, but never go below 0. The harmonic distortion of such a medium is second harmonic, the least offensive variety. It is occasionally misunderstood that single-ended amplifiers intentionally distort the signal with second harmonic in order to achieve a falsely euphonious character. This is not true. Low distortion is still an important goal, and it is my observation that deliberate injection of second harmonic into a musical signal does not improve the quality of sound. Single-ended amplification is distinct from push-pull designs in that there is only one gain device for each gain stage, and it carries the full signal alone. Linear singleended designs operate only in Class A. In contrast, push-pull designs share the signal between two opposing devices, one concentrating on the positive half, the other the negative half. This positive/negative half of an audio signal is an artifice imposed by the desire to efficiently handle an AC only signal, with no DC component. Most Push-pull Class A designs offer energy efficiency of twice that of most single-ended designs, and they also offer a measure of distortion cancellation. A well matched push-pull pair of gain devices will have lower measured distortion due to cancellation, and will concentrate the harmonic content into third harmonic and other "odd" harmonics, reflecting the symmetry between the plus and minus halves of the waveform. Operation is possible in Class A, Class AB, and Class B modes. The most linear of these is Class A, in which the circuit will dissipate at idle more than twice its rated output. of 4 watts. We can dramatically improve the efficiency if we separate bias current from signal current, so that the bias source handles purely DC, and of course our blocking capacitor insures that the speaker sees only the AC portion of the signal. We can achieve this by biasing the circuit with a constant current source and the efficiency climbs to about 20%, or about 5 times better. The constant current source provides only DC current which does not vary with the signal. 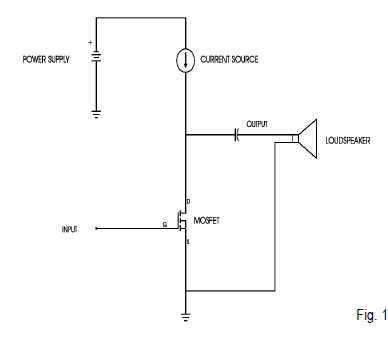 In addition to the improvement in efficiency, the constant current sources removes power supply noise from the bias and provides an absolutely constant load for the power supply. As a result of this absolutely constant power supply draw, it becomes relatively unimportant what resistance is seen in the power source circuit, and two channels can draw off of one supply without modulating each other's signal. Clearly the use of a constant current source for the bias is justified by the performance over the use of a resistor, although not every singleended designer agrees. We have to consider what type of gain device is suitable for this application. Actually the choice is simple: Bipolar devices have too low an input impedance to be useable, and tubes have too little gain to be used in a single stage power amplifier. The only usable device is the power Mosfet, which is a transconductance device like the tube, and has a high input impedance, but operates with enough gain at high enough currents to be driven directly by line-level signal. As a coincidence, the Mosfet happens to be my gain device of choice in general. Even in more complex circuits Bipolar transistors do not have the transconductance characteristic I find desirable, and tubes require a coupling transformer, with its attendant degradation. 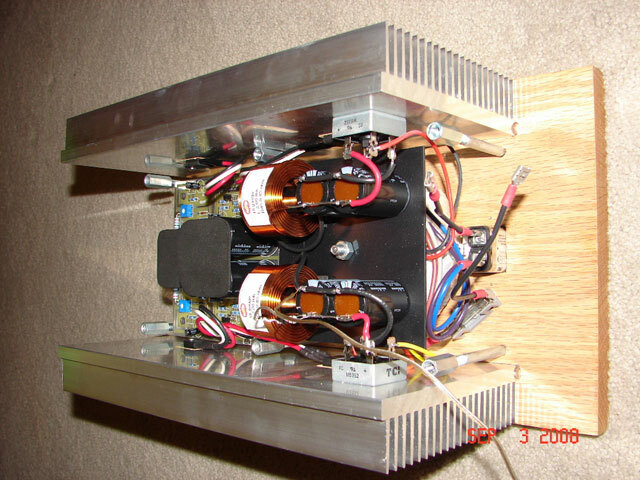 The use of transformers as a load for a single-ended circuit is very problematic, since the DC current passing through the transformer tends to saturate the core. The solution that has been employed is to use a core with an air gap, wish' the result that the primary and secondary coils become only loosely coupled, with performance suffering even more. Mosfets have not been adequately appreciated for their characteristics in high end audio. I believe this is due to the relatively lackluster sound associated with the commercial offerings to date. This is not the fault of Mosfets, however. Examination of the amplifiers on the market reveal two serious flaws in how Mosfets are being used for amplification. 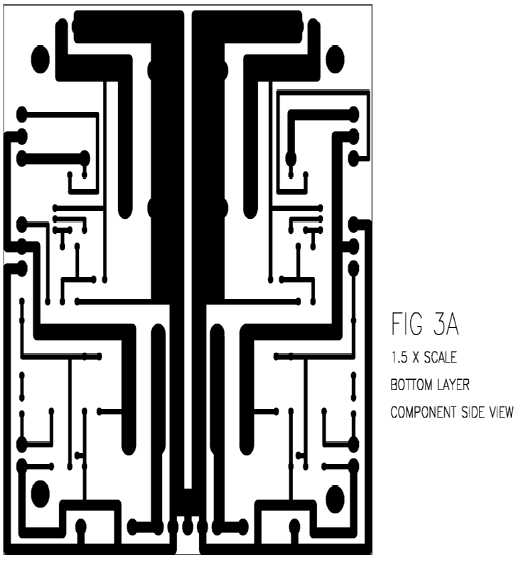 First, nearly all designers simply dropped Mosfets into the same (complex) topologies that were developed for bipolar devices without regard for their special characteristics. This unimaginative use of a new gain device results in a sound that is marginally different than the original bipolar circuit, and not much of an improvement. benefits of Mosfet transistors, they must be operated in Class A. So it is not surprising that Mosfets have not found the favor among audiophiles that the devices deserve. I expect this to change in the near future, particularly as Mosfets find their way into single-ended Class A amplifiers. Figure 2 reveals the complete circuit of the amplifier. Q1 is the gain stage, biased by the constant current source of Q2. at the gate of Q2 to about 4 volts. This little loop operates to keep the current through Q2 at a constant 2 amps. R3 and R4 are there to add stability to the loop and prevent parasitic oscillation of the Mosfet Q2. This constant 2 amp current is fed to Q1. Resistor R8 and potentiometer P1 form a DC feedback loop which operates the gate of Q1 at about 4 volts and places the Drain potential of Q2 at the midway point of the power supply, or about 17 volts. Input signal passes through C6 and R5 to the gate of Q1, and output signal passes through C3 and C4 in parallel to the loudspeaker. R9 and R2 are there to bleed off DC, but are not particularly essential. Z1 is essential to insure that an input transient cannot exceed the 20 V gate rating of the Mosfet. Fig 3 shows the PC artwork for two channels. The pattern is for singlesided (of course!) construction, but I had boards made with a ground plane on the top side of the board and plated through holes, since the difference in cost is very slight. Note that the output connections appear to be reversed in polarity. Because the topology reverses polarity, the loudspeaker plus terminals should be attached to ground and the minus terminals are attached to the active output of the amplifier. 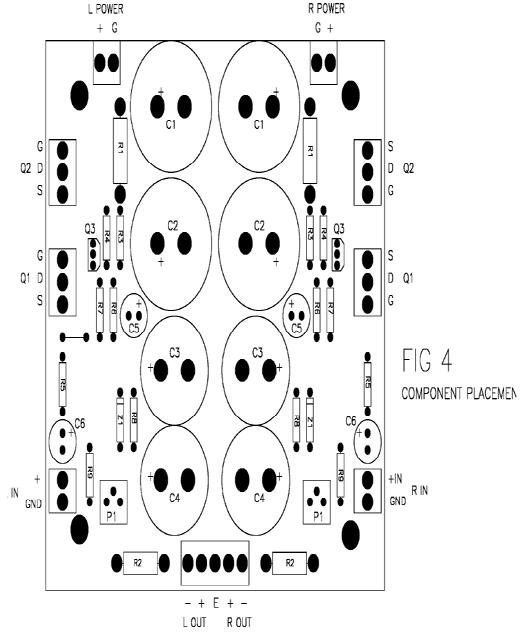 Fig 4. shows the component placement, Fig 5 is the parts list. Note that the transformer T1, the fuse F1 and the diode bridges B1 are not on the PC board. The board connections labels L POWER and R POWER attach to the diode bridge + and -. Part substitutions are certainly possible. The first requirement for the Mosfets is the ability to dissipate 30 watts continuously without failure, which means selecting devices rated at 125 watts or more. The Mosfets must be rated at 50 volts or more, and I suggest that they be rated at continuous drain currents of 10 amps or more. I have chosen International Rectifier parts in this case, and numerous substitutions will meet these requirements on the IR page of the Digikey catalog. A very important element is the heat sink. The sink for each channel must be capable of dissipating 70 watts continuously at a temperature increase of about 25 degrees Centigrade. Less heat sink will shorten the life of the Mosfets. If you find that you can't touch the heat sink in operation, I suggest the use of a fan. 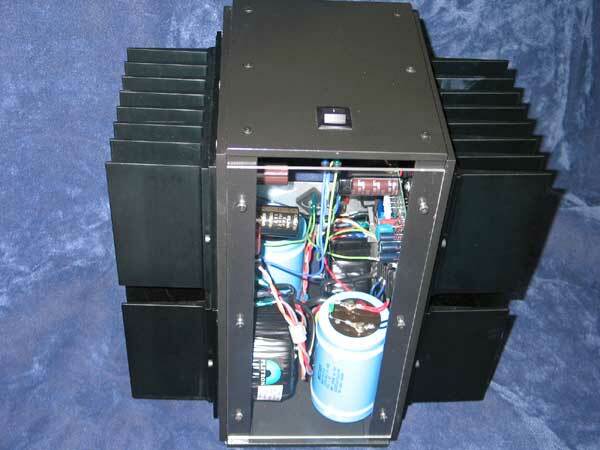 capacitors results in transformer dissipation greater than suggested by the 2 amps. From Fig 5 you can see that the suggested power transformer has a secondary coil for each channel, however it is acceptable to drive both channels from a single secondary and diode bridge. When you have completed the construction, plug it in. If the power supply fuse does not blow, you will be looking for about .66 volts across R1, no DC voltage at the output, and about 17 volts at the drains (center pins) of the Mosfets. With an input signal and an 8 ohm load, adjust P1 for symmetric clipping. Readjust P1 after the amplifier has warmed up. 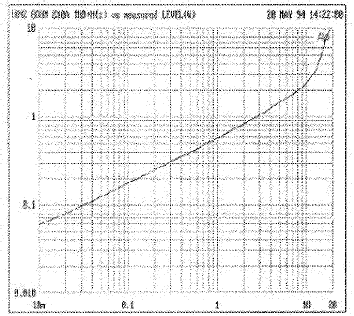 Fig 6 shows the harmonic distortion curve from 10 milliwatts to 20 watts at 1 Khz and 8 ohms. Below 10 watts the distortion is purely second harmonic. 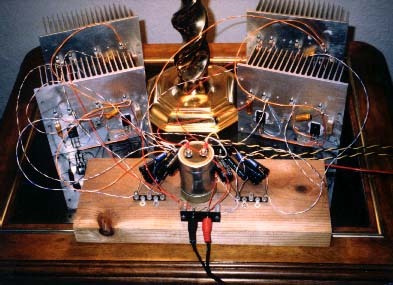 Fig 7 shows the distortion at 2 watts across the audio band. Fig 8 shows the frequency response. The amplitude is about .25 dB down at 20 Hz and about .5 dB down at 20 Khz. The output impedance of the amplifier is approximately 1 ohm, with a damping factor of about 8. 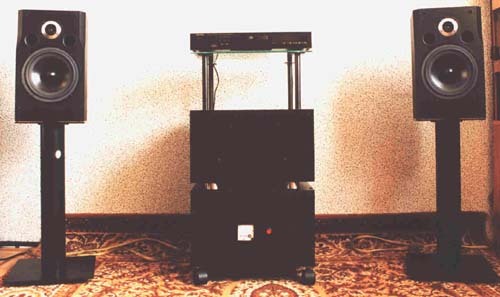 There will be loudspeakers that are not suitable loads for this amplifier, either because they need high damping factor, have an impedance below 8 ohms, or require more than 10 watts. 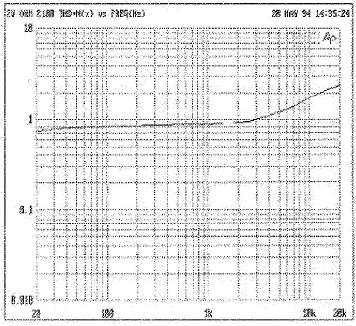 At impedances below 8 ohms, the output of the amplifier will not increase, it will drop off. This is because the single-ended design can source only the value of the bias current, and will not operated linearly beyond the bias point. There are quite a few loudspeakers with 8-16 ohm impedances and sensitivities in the 90-100 dB range which are quite suitable. 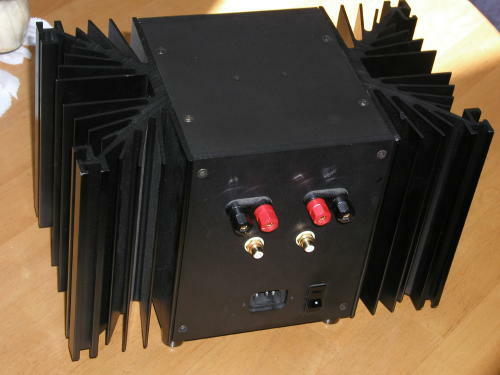 The amplifier is also quite at home as a midrange or tweeter amp, and is particularly good with horn loaded drivers. If you desire to drive 4 ohm loads with twice the power, l suggest simply paralleling the two channels into mono at the input and output terminals. The input impedance is 4.75 Kohms, and the gain is about 8.5 dB. 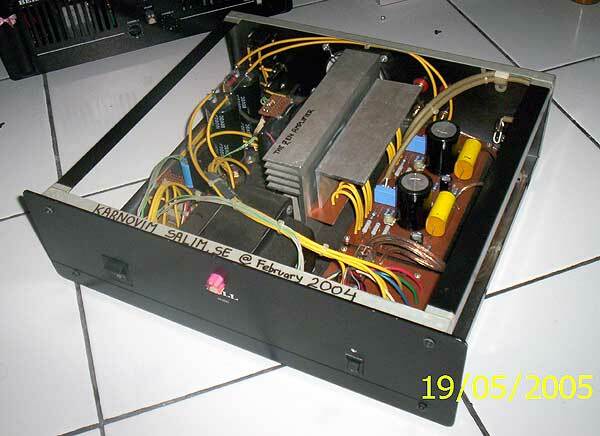 This means that the amplifier must be driven by an active source capable of delivering 3.5 volts at 700 microamps. The input characteristic can be adjusted for sources with more voltage and less current by increasing R5, and can be adjusted for sources with more current and less voltage by decreasing R5 in proportion. So how does it sound? With the right loudspeaker, simply wonderful. 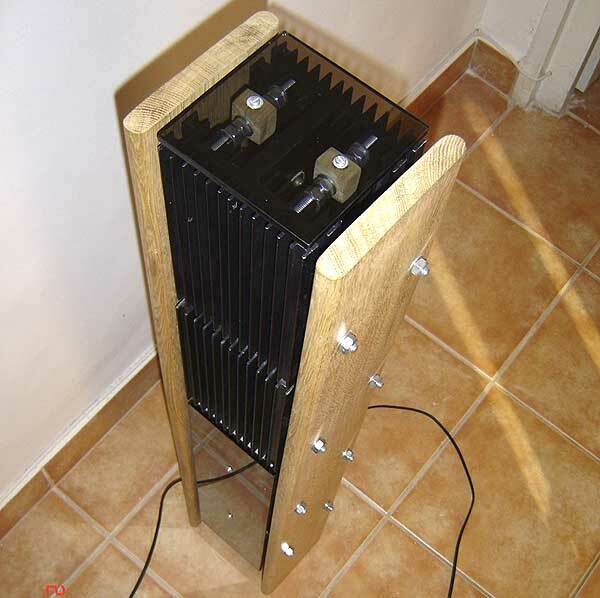 Inevitably after publishing a project such as this, I receive a large number of inquiries as to how to improve the design How to make it bigger, smaller, better; Use better wire, better capacitors, better connectors. Do I offer kits, parts; Do I sell directly; Will I repair amplifiers? Pass Labs, PO Box 219, 24449 Foresthill Rd. I don't offer kits, sell directly, or repair. Free advice is sparingly dispensed. 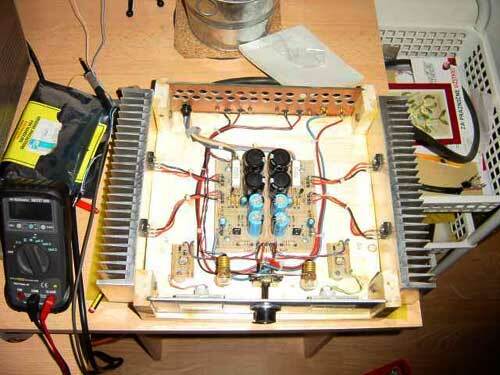 By way of improving the amplifier, you are free to use any better part you like. 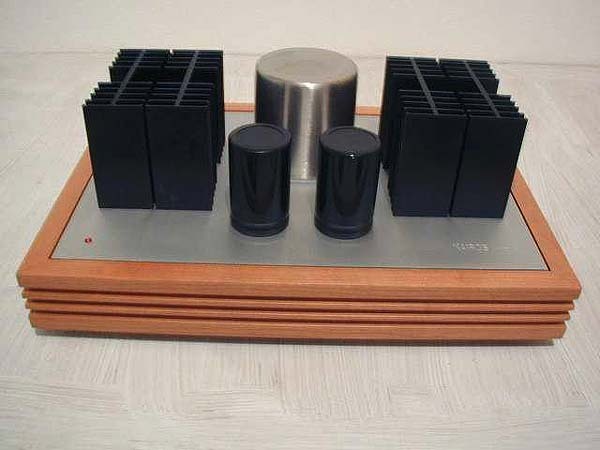 It is highly unlikely that you will ask for a smaller amplifier, and if you desire a larger amplifier, l suggest that you find bigger parts and build it. All the elements here are easily scaleable, and you can either find bigger Mosfets or run the existing ones closer to their limits. I have constructed larger versions of this circuit using industrial Mosfet packages which are rated at 600 watts apiece, and they work fine. 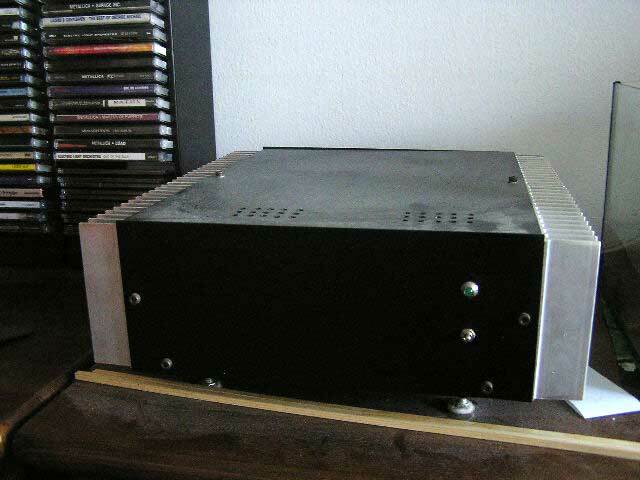 The simplicity of the amplifier allows a great tolerance to modification. Unlike most designs, it is not parts-critical, and there is no frequency and feedback stabilizing compensation required. When evaluating parts for a scaled-up version, the dissipation and voltage ratings of the components are the elements which deserve attention. Aside from better capacitors and such are there other ways of making the circuit better? It so happens that there are, and the best of them is the subject of a patent recently granted to Pass Labs. If there is sufficient continued interest in this approach to amplification, perhaps it will form the basis of another article.